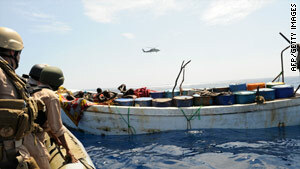 U.S. naval forces investigate a suspected pirate skiff in the Gulf of Aden earlier this year. (CNN) -- The Seychelles Coast Guard and the Australian navy separately disrupted two potential pirate attacks in the Gulf of Aden, officials said Sunday. In the first incident, the Seychelles Coast Guard were led to the suspected pirates Saturday by a Swedish plane that is part of the European Union Naval Force. The alleged pirate group consisted of a whaler, used as a mother ship, and two attack skiffs. The boats were first spotted about 500 nautical miles east of the Somali coast, the naval force said. "After confirming that they had pirate paraphernalia on board, nine suspected pirates were disarmed and their two attack skiffs were destroyed," EU NAVFOR said in a statement. "The suspected pirates were then embarked in their mother ship (whaler) and released," it added. Authorities take suspected pirates into custody if they are caught during an attack. In the second incident announced Sunday, the Australian navy spotted a suspicious skiff about one nautical mile from a merchant vessel. When the navy ship Parramatta approached the skiff, it took off, the Combined Maritime Forces said in a statement. The warship crew noticed the people in the skiff throwing items in the water, the statement said. "When Parramatta closed in on the skiff, the suspected pirates raised their hands in surrender and a boarding team was dispatched to the vessel. Fifteen drums of fuel were found on board," the statement said. The skiff was marked with indelible paint to allow coalition and other forces to track and identify of the skiff in the future. The suspected pirates were released.